This page is written by the game's inventor, Silvia Hollinshead. Palace Shogi is a synthesis of several games, namely Shogi, Xiangqi, Janggi, Shatranj, Hiashatar, and western Chess. Palace Shogi is generally thematically organized around tensions related to strategic contingency. Palace Shogi is played on a 9x9 grid gameboard. The dimensions of the grid follow Shogi, but the spaces are checkered dark and light. The board generally resembles that of Shogi but includes two palace zones, correlating somewhat to the palaces in Janggi, but with specific rules that will be explained in detail below. The palaces are 3x3 spaces, centered at the first to third ranks and seventh to ninth ranks of the gameboard. The palaces are demarcated on the board through the light spaces within the palaces being colored differently than otherwise on the board. The colored spaces within the palace are called corridors, and correspond to the diagonal lines within the palaces in Janggi. Each player's corridor spaces are colored differently than the other player's. Several piece movements are affected by the palace; detailed rules will be explained below. Kings are not confined within the palaces. Preferred game notation represents files with numbers from right to left and ranks with lowercase letters from top to bottom, or in other words the top right corner is 1a and the bottom left corner is 9i. During setup, the positions of the horse and silver general can be transposed; this opening phase of the game is called marshalling. The horse and silver general can be switched at one side, at the other side, or at both sides, which in addition to the standard setup illustrated above allows each player a choice of four arrangements. First, black makes their arrangement; after this, white has the same choice of four arrangements, of which they choose one. This results in sixteen possible starting setups. Game pieces are wedges shaped as in Shogi and generally follow the size ratios among wedges as in Shogi, but display pictographic icons rather than kanji (except in one case). The size of the queen's wedge is the same as the king's. The opposing players' pieces are undifferentiated by color. Control of a piece is displayed by direction exactly as in Shogi, pieces facing forward. Seven of eight piece types have graphics on each side. The icons on each side represent the piece's unpromoted and promoted states. Only the king piece is empty on its reverse side (the king does not have a promoted state). In most cases the piece's icon is displayed in black on one side, and in red on the other (promoted) side. Usually this is an iconographic picture rather than kanji, except in the case of the lance/cannon. In one case, the queen/lion, the icon is displayed in black on one side and in gold on the other (promoted) side. When promotion occurs in game, the piece is flipped over revealing the icon of its promoted state, similarly as in Shogi. Some pieces begin the game in promoted state, but most pieces achieve promotion after entering the promotion zone, which is the last three ranks of the gameboard furthest from the player, following similar rules as in Shogi. Detailed rules on promotion are spelled out below. Stepping means moving one space at a time to any adjacent space not occupied by a friendly piece. Jumping means movement to a destination that passes over or ignores any intervening pieces, whether friendly or enemy, with no effect on either the jumping or intervening piece. In reaching their destination, jumping pieces can jump over other pieces and are not blocked from moving if adjacent spaces are occupied. Sliding means moving any number of empty spaces along a straight orthogonal or diagonal line. If an enemy piece intervenes along the sliding piece's path, it may be captured by moving the sliding piece to that space and displacing it. If a friendly piece intervenes, the moving slider is limited to a distance that stops short of the intervening friendly piece. Piece names are followed by their algebraic notation in parentheses. Pawns (+P) move like pawns in Chess. The pawn is one of only two pieces that captures differently than it ordinarily moves. Pawns move by stepping forward one space at a time, but capture by stepping one space diagonally-forward (forward-right or forward-left). A pawn cannot capture by stepping directly forward. Pawns can never move backwards. A pawn can step forward two spaces as its initial move, as in Chess. Pawns cannot capture with this move, or jump over intervening pieces. En passant rules related to this are applied exactly as in Chess. Unlike most pieces, pawns begin the game in promoted state, or are considered the promoted state of the footsoldier. Each player begins with 9 pawns in a line across the third rank nearest them. Footsoldiers (P) move generally like the Xiangqi footsoldier. A footsoldier steps one space forward. Footsoldiers additionally gain a sidestep move or ability to step one space either left or right, after crossing from the fifth to sixth rank (corresponding to a similar rule in Xiangqi). In all cases, footsoldiers capture exactly as they move. Footsoldiers can never move backwards. If a footsoldier reaches the final rank, it can only step sideways. Footsoldiers can also step one space diagonally-forward within the enemy palace corridors, stepping diagonally-forward from one corridor space to another, in this case as others capturing exactly as they move. Footsoldiers can only enter the game as drops, after enemy pawns are captured and held, then dropped in unpromoted state. No player can have more than five footsoldiers on the gameboard at a time. Lances (L) move like the lance or kyosha (incense chariot) in Shogi. A lance can slide any number of spaces vertically forward, and cannot move backwards. Each player begins with two lances. Cannons (+L) have resemblance to the cannons in Xiangqi and Janggi. Cannons capture differently than they ordinarily move. Cannons ordinarily move by sliding any distance horizontally or vertically in any direction, like the rook. Cannons however can only capture by hopping a single piece, friendly or enemy, along the path of attack. The cannon then moves to the space of the captured piece and displaces it. The piece over which the cannon hops is called the screen. The hop can be performed over any distance, provided there is exactly one piece between the cannon's original position and its target. Any number of unoccupied spaces, including none, may exist between the cannon, screen, and piece to be captured. The screen piece over which the cannon hops cannot be another cannon. A cannon also cannot capture another cannon. Cannons enter the game through promotion of lances. Cannons can move by sliding diagonally within the palace corridors, in a straight line during the move, like the bishop except without capturing. Cannons can capture by diagonally hopping from one outer corner corridor of the palace to the opposite corner corridor, if there is a suitable screen piece in the middle corridor space of the palace. Horses (N) move like the keima (laurel horse) in Shogi. Horses jump forward in L-shaped moves, two spaces forward and one space left or right. Horses cannot move backwards. Each player begins with two horses. Knights (+N) move like the knight in Chess. Knights jump in L-shaped moves like the horse, but in any direction. Knights move two spaces vertically and one space horizontally, or two spaces horizontally and one space vertically, giving knights ability to move to any of the closest board spaces that are not on the same file, rank, or diagonal. Knights enter the game if horses are promoted. Bishops (B) move like the bishop in Chess or kakugyo (angle-mover) in Shogi. Bishops slide any number of spaces in a diagonal direction. A player's initial bishop while unpromoted can only access half of the spaces on the board, or the dark spaces it can reach diagonally. A bishop dropped onto a light space can in unpromoted state reach only light spaces. Each player begins with one bishop. Elephants (+B) wield the combined move sets of the ryuma (dragon-horse) in Shogi and the alfil (elephant) in Shatranj. Elephants can slide any number of spaces in a diagonal direction like a bishop, and can step one space in any orthogonal direction. Additionally, elephants can jump two spaces in any of the four diagonal directions over intermediate pieces -- this move is called the alfil jump. Elephants enter the game upon promotion of bishops. Rooks (R) move like the rook in chess, hisha (flying chariot) in Shogi, or similar pieces in other related games. Rooks can slide any number of spaces horizontally or vertically. Each player begins with one rook. Dragons (+R) wield the combined movesets of the ryuo (dragon king) in Shogi and the dabbaba (war engine) in Shatranj Al-Kabir. Dragons can slide any number of spaces in an orthogonal direction like a rook, and can step one space in any diagonal direction. Additionally, dragons can jump two spaces in any of the four orthogonal directions over intermediate pieces -- this move is called the dabbaba jump. Dragons enter the game upon promotion of rooks. Dragons can move and capture by sliding diagonally, like bishops, along the corridors within the enemy palace. Silver generals (S) move like the corresponding piece in Shogi. A silver general steps one space diagonally in any direction, or one space straight forward, giving it five possible destinations. Each player begins with two silver generals. Gold generals (+S) move ordinarily like the corresponding piece in Shogi. A gold general steps one space orthogonally in any direction, or one space diagonally forward, giving it six possible destinations. Gold generals also have a special moveset within the home palace that corresponds to the ordinary movement of the hia in Hiashatar, or stepping 1 to 2 spaces any direction in a straight line. This moveset is called the senior adviser. The senior adviser move can capture on the first or second step, but cannot continue stepping after a first step that involves a capture, and cannot jump over intermediate pieces. The senior adviser moveset applies to movement within the home palace, or movement from within the home palace stepping outside the home palace. Any move by the gold general beginning within the home palace entails senior adviser power. Any move beginning outside the home palace entails the ordinary moveset of the gold general, and the enemy palace does not impact the movement of the gold general in any way. The senior adviser moveset of the gold general does not have the power to check the opposing king. The gold general in its ordinary moveset can check the king, but the senior adviser move cannot. The gold general however always potentially wields its ordinary moveset even when inside the home palace, with ability to check the opposing king (technically, the gold general wields both its ordinary moveset and the senior adviser moveset when within the home palace, which has relevance toward checking the opposing king). The gold general also may move as senior adviser to a space where it then immediately delivers check or checkmate through its ordinary moveset. Each player begins with two gold generals, and additional gold generals can enter the game through promotion of silver generals. Queens (Q) have two separate and distinct movesets depending on gameboard position. In most board positions, queens move like the queen in Chess, or the honno in Chu Shogi. This moveset is called the free queen. The free queen can slide any number of spaces along any of the eight orthogonal or diagonal directions. The queen moves differently inside the home palace. Inside the home palace, the queen can only move like the fers in Shatranj, or one space diagonally in any direction forward or backward. If the queen exits then re-enters the home palace, the same restrictions on movement still apply. The queen upon re-entering the palace can however be limited to a different range of spaces inside the palace than at the game beginning, or in other words while at the beginning of the game the queen can only move diagonally along the corridors, depending on the point of re-entry the queen can be instead restricted to moving on dark gameboard spaces inside the palace. There is no limit to the number of times a queen can exit and re-enter the home palace. The free queen's movements are not restricted by the opposing player's palace. Outside the home palace, the free queen generally moves like in Chess, however she is still affected by the home palace's "walls". The free queen cannot move through the home palace as if it weren't there. Any move by the free queen from outside her palace into her palace always ends at the first space of entry. The queen can never enter and exit her own palace within a single move. This can have impact regarding whether a queen has the opposing king in check -- a "clear line of sight" between a queen and opposing king does not put the king in check in a situation in which the queen could not actually move to that space without entering and leaving her own palace. Lions (+Q) move and capture generally like the lion in Chu Shogi. The lion can take one step in any direction up to twice per turn; taking only one step is also allowed. It can continue after a capture on the first step, and can potentially capture two pieces in one turn. It can change directions after the first step, so that it can reach the same spaces as a knight. Capturing a piece and returning to the original space is allowed: returning to its starting space with the second step, the lion can effectively capture a piece on an adjacent space as if it had not moved. This move is called stationary feeding. The lion can also step to an adjacent empty space and back without capturing anything, leaving the board unchanged or effectively passing a turn, but this is only possible if at least one adjacent space is vacant. This move is called staring. "Lion trading" rules are not the same as in Chu Shogi. These rules apply: One lion cannot capture another lion. Each player can only have one lion at a time. Lions enter the game through promotion of queens. Other rules concerning this are explained below. Kings (K) have the same basic move set and piece principles as the king in Chess or correlative piece in Shogi. A king steps one space in any direction, orthogonal or diagonal. This rule applies to kings facing one other along a file, including if the kings are facing one another "backwards" (or their wedges are pointing opposite directions) along the file, butÂ does not apply to horizontal or diagonal lines. A king that enters the enemy palace automatically delivers checkmate. This move is called the entering king. Any legal move by the king into the enemy palace delivers checkmate. A king cannot move into check entering the palace, but the king can legally move out of check into the enemy palace and deliver checkmate if that would otherwise be a legal move. The player moving first can be referred to as black and the player moving second white, as in Shogi. The objective of Palace Shogi is to win the game by checkmating the other player's king. The king is the only piece that cannot be captured; all other pieces are captured through displacement, corresponding to rules in Chess and related games: if a piece moves to a space occupied by an enemy piece, the enemy piece is displaced and removed from the board. Capturing a piece leads to it being either killed or held, depending on whether it has promoted status. A killed piece is eliminated from the game. A held piece is removed from the gameboard and held in hand by the capturing player, and can be dropped onto the gameboard in subsequent turns as a piece under that player's own control. Pieces are always dropped in their unpromoted state. Detailed rules on drops are spelled out below. A footsoldier, lance, horse, bishop, rook, silver general, or queen is killed upon capture. A pawn, cannon, knight, elephant, dragon, gold general, or lion is held upon capture. Any piece in promoted state (indicated by algebraic notation beginning with "+") is held upon capture. The promotion zone is defined as in Shogi, as the final three ranks of the gameboard furthest from the player, or spaces that are mostly occupied by the opposing player at the beginning of the game. After any move that ends inside the promotion zone, a lance, horse, bishop, or rook will promote. In game, this is displayed by flipping the piece wedge to change its icon color. After any move into, within, or out of the promotion zone, a silver general or queen has ability to promote or not at the player's discretion. Choosing not to promote the piece could in many circumstances be tactically or strategically effective. A footsoldier, which enters the game as a dropped piece resultant from a captured/held pawn, cannot re-promote to pawn. A footsoldier that progresses to the promotion zone is not specifically impacted by the promotion zone (although it has other moveset changes in overlapping board areas). Any piece that is promoted is permanently promoted, unless/until it's captured, in which case it can be dropped by the opposing player and reintroduced onto the board under their control in its unpromoted state. All pieces in promoted state (signified with "+" in algrebraic notation) are held upon capture and can be dropped in unpromoted state. With the exception of the pawn/footsoldier, any piece with promoted status that is captured and held by the opposing player and then dropped can be re-promoted through its ordinary means described above regarding movement into (or within or out of) the promotion zone. A piece can theoretically be promoted, captured, dropped, re-promoted, re-captured, and re-dropped unlimited times in a game if during that process it happens to never be captured and killed in unpromoted state. A silver general dropped into the promotion zone cannot promote to gold general immediately upon the drop, but can do so if desired on any subsequent move it makes within, out of, or re-entering the promotion zone according to its ordinary promotion rules. Transformation of pawns: A pawn upon reaching the final rank transforms to queen, similarly as in Chess. A pawn's advancement to queen is referred to as transformation, as it does not involve flipping the piece as during a regular promotion but involves changing the form of the piece (on the game-board, the pawn is replaced by the new queen). Any new queen is identical in her moves to the original queen, with the exception that if the player controlling the new queen also controls a lion on the board, the new queen cannot promote to lion -- each player can only have one lion at a time. If a player does not have a lion, that player's new queen resulting from transforming a pawn can upon completion of its first move as queen promote to lion if desired by the player, as that move would be beginning from within the promotion zone, on the final rank where the pawn transformed to queen. If one lion is captured, another queen can promote to lion if desired by the player, through typical means moving into, within, or out of the promotion zone. This can happen multiple times, or the potential number of times is only limited by the number of pawns that can transform to queen then individually promote to lion (or the probability of such actually occurring multiple times during a game). Captured pieces with promoted state (marked by "+" algrebraic notation) are held by the capturing player, and can be dropped in unpromoted state onto empty gameboard spaces on subsequent turns, similarly as in Shogi. Pieces are always dropped in unpromoted state. A drop counts as a complete move, or occurs instead of moving a piece already on the board. A drop cannot capture a piece (pieces can only be dropped onto empty spaces). Any drop can immediately result in a check. Any drop except by a footsoldier can immediately result in a checkmate. A footsoldier can be dropped only on the first four ranks nearest the player. A lance, horse, or bishop can be dropped only on the first five ranks nearest the player. A rook can be dropped only on the first six ranks nearest the player. A silver general can be dropped on any empty space on the board, except within the enemy palace. A queen can be dropped only within the home palace. A footsoldier can never deliver a checkmate through its drop move. Dropping a footsoldier onto a space in which it would immediately deliver checkmate is an illegal move that cannot be performed. No footsoldier can be dropped on a file that already contains a footsoldier controlled by the player in the first six ranks nearest the player. A player cannot have more than five footsoldiers on the gameboard at a time. 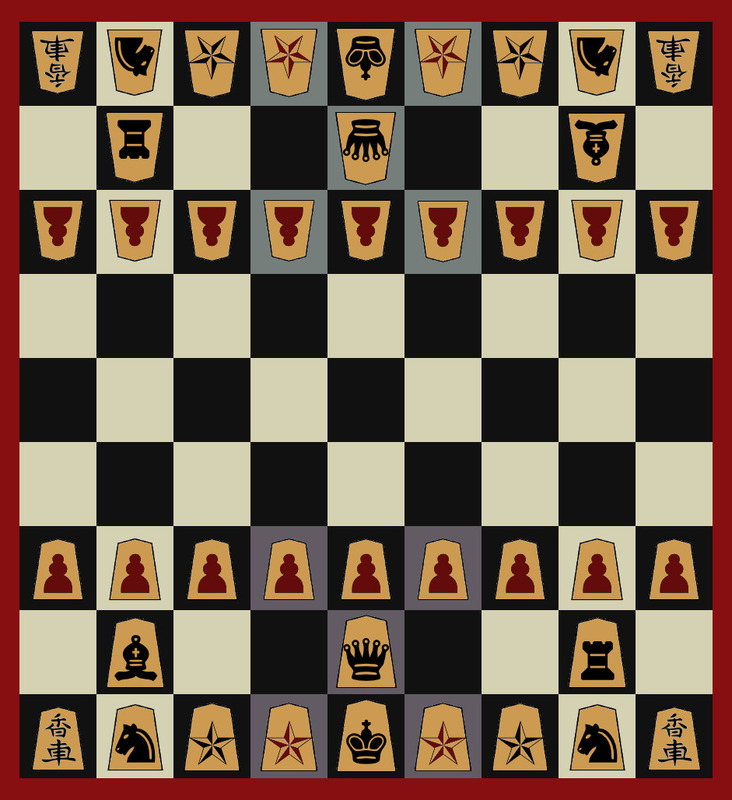 The number and positions of pawns on the board have no limiting effect on a player's ability to drop held footsoldiers. A player's king can castle with either of that player's lances. Castling can occur if there are no pieces between the king and lance, and neither the king nor that lance has moved yet during the game. Castling results in the king moving two spaces toward the lance, and the lance moving to the space at the other side of the king (the king moves to g and the lance to f, or the king moves to c and the lance to d). In castling, the king moves outside the palace and the lance moves into the palace. After castling, the lance involved moves ordinarily on all subsequent turns from its changed position, or it still slides only forward but on a different file. A dropped lance counts as having already moved in the game, and cannot castle in any circumstances. The rook is not involved in castling. Stalemate occurs when the player whose turn it is to move has no legal move and is not in check.